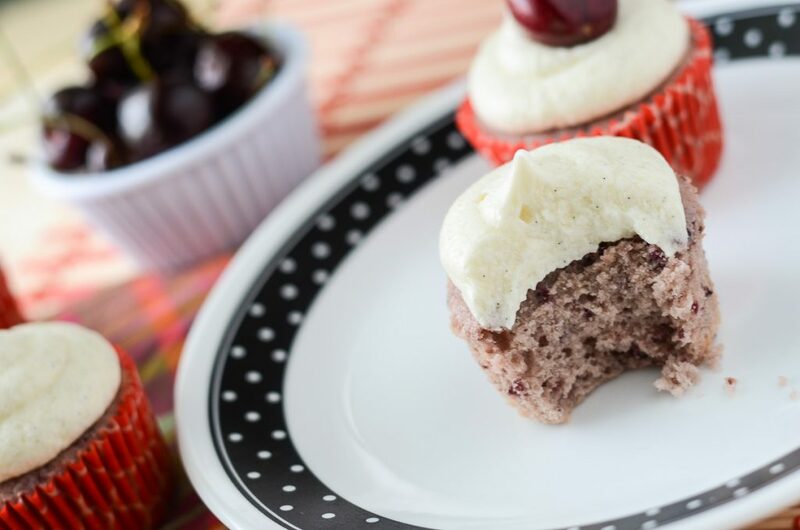 Moist, crumby Black Cherry Cupcakes, bursting with the flavor of fresh cherries, and topped with a light, fluffy vanilla bean buttercream. Cherries have been on sale for months, it seems. I read somewhere that, after an awful year in 2013, cherry farmers were really making up for it this year, with lots and lots of plump, juicy babies. I can honestly say, I’ve been taking advantage of this. Who knows when they’ll be $1.99 a pound again? Between Mr. Crumby and I, we’ve probably eaten through a good 5 pounds in the last 2 or 3 weeks, not counting all the recipes I’ve used them in. Just straight, spit-out-the-pit cherries. 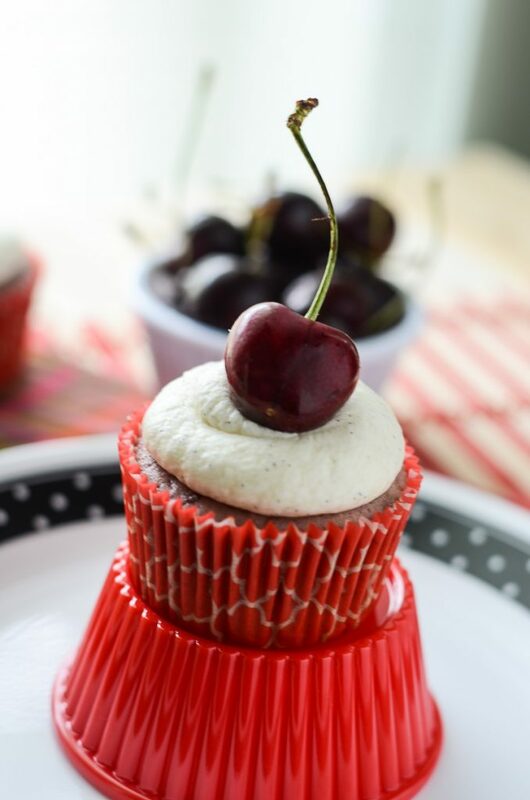 I love them on their own, but they are even better in these Black Cherry Cupcakes. Cupcakes are my thing. Ask any of my friends. If there’s a party to attend or an event that needs some sort of dessert (and many times, even if it doesn’t need one…), I’m volunteering my cupcake services. I don’t know what it is about them, aside from how delicious they are (obviously), that makes me love them so. Maybe it’s how portable they are; no muss, no fuss, no need for a fork and plate. Maybe it’s their versatility; how easy it is to create and blend flavors, or make only a half batch (or even just a couple! ), instead of a whole cake which could potentially go to waste. Maybe it’s the smile they put on the faces of the youngest to the oldest. Because you’re never too old to enjoy a happy looking cupcake. Maybe it’s that stuff. But I think it’s definitely because of how stinkin’ cute they are. I mean, come on. Tell me that isn’t adorable. He’s got his own cherry to hug with his icing hat. Speaking of icing, that vanilla bean buttercreme? HOLY GOD. It is SO good. I rarely have used vanilla bean up until now, just because they’re so expensive ($8 for a bean? Pfft). I recently discovered that World Market carries them in packages of 2, and they’re only $2.99! I was all about that. I scooped up, like, 4 packs and went on my merry way, my pockets only a little bit lighter, and dreaming about all the things I could do with them. And the first recipe that deserved the bean was this one. 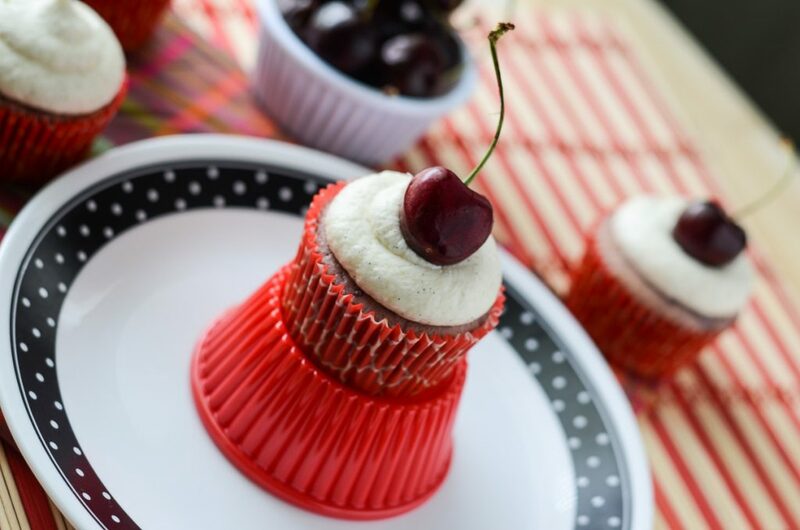 Fresh cherries, blended and baked into a classic vanilla cupcake. There’s a touch of almond extract in here too, which lends a nice touch to the flavor of the cupcake, but it won’t suffer if you non-almond lovers take it out. Just boost the vanilla a bit, or go crazy and try adding some lemon extract! Place cherries and lemon juice in food processor or blender; blend until mostly smooth. Stir buttermilk into cherries. Set aside. Fit mixer with paddle attachment, or, using a hand mixer, cream butter and sugar until light and fluffy (about 3 minutes), being sure to scrape down the sides during mixing. While butter is creaming, whisk flour, baking powder, and salt together in a medium bowl. Set aside. Add eggs, vanilla extract, and almond extract to the butter mixture; mix until well blended. Add half of the cherry mixture to the batter and mix, then add half of the dry ingredients and mix on low speed. Scrape bowl and repeat, mixing until all ingredients are incorporated. Portion batter into cupcake liners, filling each about ⅔ full. Bake for 18-20 minutes, or until a toothpick inserted in the center comes out clean. Remove to wire rack to cool. While cupcakes are cooling, with an electric or stand mixer fitted with a paddle attachment, beat softened butter for 8 minutes on medium speed, until creamy and pale yellow. Add powdered sugar, milk, vanilla and vanilla bean, and salt, and mix on low speed for 1 minute; turn speed up to medium and mix for another 5 minutes, until buttercream is light and fluffy. 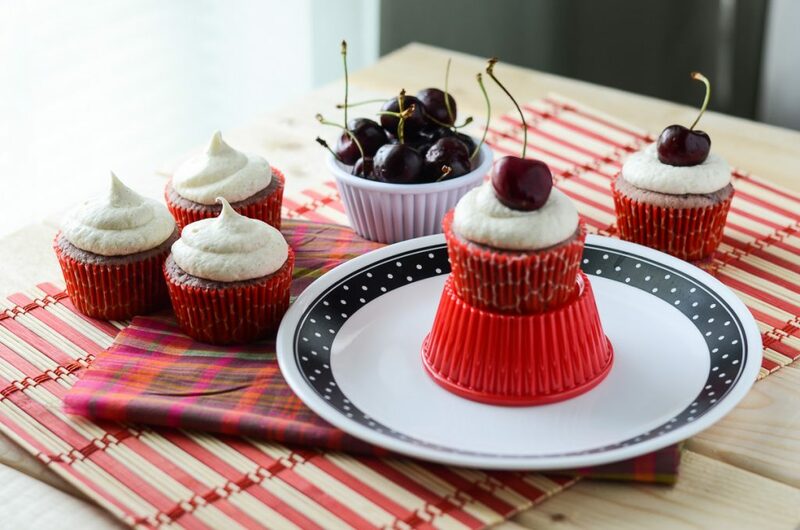 Pipe buttercream on cooled cupcakes, and garnish with cherries. Yep. They’re just too stinkin’ cute. 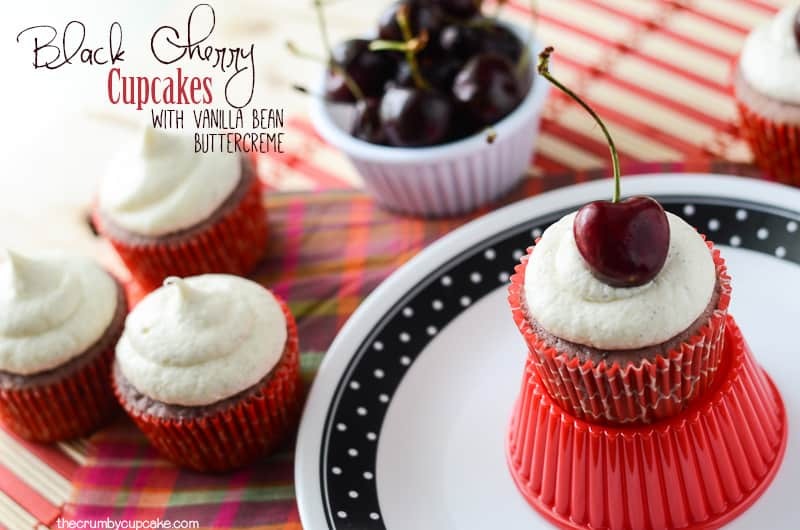 I’m pinning to my cupcake board – they look divine!! These are truly beautiful! 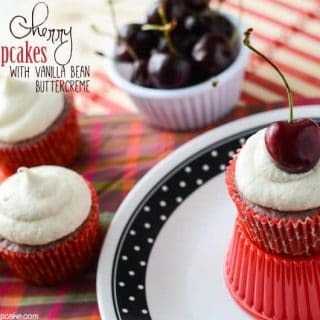 I’ve never had a cherry cupcake before. Thanks, Krystal! Give them a try! If you like cherries, you’ll love them!